From this event, Floyd Mutrux and Colin Escott concocted a book for Million Dollar Quartet, now showing at Seven Angels Theatre, directed by Semina De Laurentis. The show is a “jukebox musical”: a collection of well-known songs linked by a loose story. Most of the fun is in the songs themselves and in seeing actor/musicians emulate these four famous entertainers. For fans of the actual performers, the show is like a fantasy fulfilled. These guys put the songs across and that’s all that really matters. The actual event has the status of one of those occurrences that feels apocryphal even if factual, and that helps the show as well. Sam Phillips, played with an emphatic grasp of his role in all this by Jason Loughlin, addresses the audience and spins the yarn. A number of details from his relations with each singer help create the context for what we see. Daniel Husvar’s set is a great space that looks like Sun, in its drab coloring, and has the thrilling feel of a place where great music can be made. Phillips doubles between emcee for the stage event we’re watching, and narrator/actor in scenes with the singers. Each of the four is introduced by a signature song and little snippet from Phillips’ early interaction with him. In each case, Phillips not only discovered the talent, he helped each find a niche in the burgeoning rock & roll market where originality was a must. But now the bonds are fraying. Perkins (Jeremy Sevelovitz) has a chip on his shoulder. He got hot with his composition “Blue Suede Shoes,” only to see it “stolen” and performed on the Ed Sullivan Show by Presley. His gripe is that Phillips put more of his limited promotion machinery behind Presley, leaving Perkins in the lurch. Meanwhile, Phillips is keen to get Cash to sign a contract extension, while Cash (Sky Seals) is embarrassed to be leaving the label for a better deal at Columbia. Presley (Cole), meanwhile, has just come off a humiliating stint in Las Vegas at the behest of his manager Colonel Tom Parker who thinks rock & roll is a flash in the pan and that Elvis needs to court show-biz via Vegas and Hollywood. That strategy provides the kiss of death to Elvis the rocker, and it’s to the show’s credit that it gives us Elvis at a vulnerable crossroads. He’d like to get back to where he once belonged. 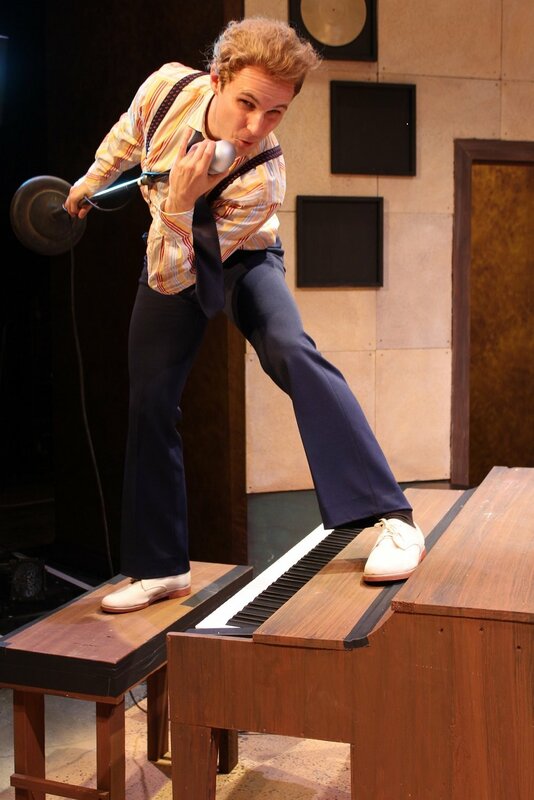 Then there’s Jerry Lee Lewis (Dominique Scott, the show’s music director). He’s played as the wild card, the upstart, the class clown. Lewis’s facility as a musician eclipses them all, but he still has to prove himself on the charts, as the other three already have. The key question is: does the show rock? And the answer is an emphatic yes. De Laurentis gets performances that aren’t caricatures but are emblematic of each artist. Lewis’ hair and flamboyant piano playing—including flinging his foot onto the keys and playing blindfolded; Cash’s black duds, deep voice and way of brandishing his guitar; Perkins’ rockabilly guitar licks and concentrated, no-nonsense presence; and, of course, Presley’s swaying pelvis, hand gestures, and wavy vocals. Perry Orfanella holds down the stand-up bass as Perkins’ Brother Jay, and Mark Ryan sits in on the drumkit as Fluke, both played as patient session men content to look on as these big names strut their stuff. Then there’s Teresa Danskey as Dyanne, a singer Presley wants Phillips to hear. Danskey’s torch-song rendering of “Fever” is a highpoint. Her presence suppresses the fact that a female rock & roll singer to equal any of these four men would be some time in coming. Of the “quartet,” Scott’s Lewis sets out to be the crowd-pleaser and mainly succeeds. Cole’s Presley lets us see that being Elvis is something Presley is still learning. As Cash, Seals’ waistline recalls the later Cash rather than the Sun period. He does a remarkable rendering of “Folsom Prison Blues” but sings elsewhere a bit higher than Cash’s characteristic baritone. As Perkins, Sevelovitz seems genuinely of the era and region; his “Who Do You Love” is a strong number early in the show before the others turn up. The show brings together some of the best-known songs by these artists, but it also makes room for a few of the gospel tunes they actually sang that night. Act I closes with “I Shall Not Be Moved” and Act II’s finale/encore is “Whole Lotta Shakin’”: Walking the line from songs of inspiration to songs of fornication is key to these four good ol’ boys’ genre of rock & roll. Lewis, cousin to televangelist Jimmy Swaggart, takes on the fire and brimstone tone against the evils of rock even as he rocks harder than the others. There are paradoxes in these figures, not least in Phillips who professes his dedication to this music but brags how he invested the money he got for Presley’s contract in the Holiday Inn chain. Million Dollar Quartet isn’t history, and it doesn’t take apart the characters of these beloved figures. It puts classic rock onstage and shows us men—and a woman—who play and sing in unique ways. The show lets us imagine these four together, on stage in a studio, trying to live up to their own talents. Rock & roll thrives on the inherent drama in that effort, and so does Million Dollar Quartet.